In University Theatre’s “The Father,” reality morphs and crumbles, and audience members may find themselves “misremembering” key moments. The story is told through the eyes of a man suffering from dementia. 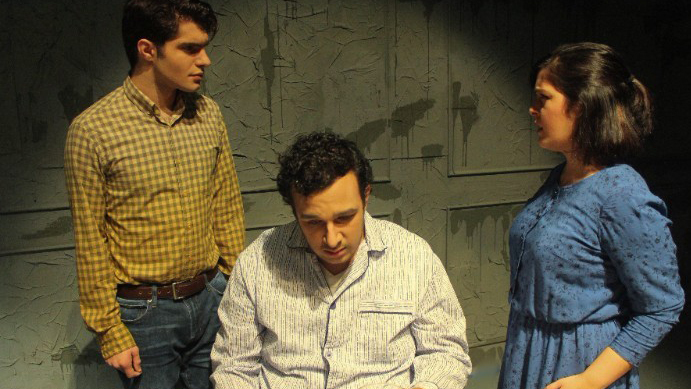 The play opens on Jan. 26 at 7:30 p.m. at Hope Theatre and runs through Feb. 10. On Feb. 4, after a 2 p.m. showing, an open discussion will be held featuring two caregivers, a physician and possibly a person living with Alzheimer’s. “The Father,” written by French playwright Florian Zeller, premiered in Paris in 2012 and won France’s prestigious Molière Award in 2014. Its English translation reached Broadway in 2016. While putting the play together, Barre met with Abby Gershenzon, the regional coordinator of the Alzheimer’s Association Cascade Coast office. Gershenzon came on set to give a presentation on Alzheimer’s. “We were constantly thinking, okay, based on the things that we know, from our research and from talking with Abby, all of these are the choices that we’ve made so that the ways in which we are dealing with dementia and Alzheimer’s are as a realistic as possible,” Barre said. In a country where one in 10 people over the age of 65 have Alzheimer's, Barre isn’t the only person involved with the play who has a personal connection to the disease. Barre hopes the Feb. 4 discussion will be a dialogue between the experts and the audience, many of whom will likely also have loved ones affected by Alzheimer’s or dementia. Ultimately, Barre wants audience members to walk away with understanding and compassion for those affected by degenerative brain diseases. For show times and dates and to purchase tickets, visit the UO Ticket Office’s website. Tickets are $10 for adults, $8 for seniors, faculty, staff and non-UO students, and free for UO students.